candor clearly showed the falsity of their statements. The governor appointed in the place of Felix, was Porcius Festus, a far more honorable ruler. He had a higher sense of the responsibility of his position, and, refusing to accept bribes, he [p. 247] endeavored to administer justice. Three days after his arrival at Caesarea, Festus went up to Jerusalem. Here he was speedily importuned by the Jews, who lost no time in presenting their accusations against Paul. The long imprisonment of Paul had not softened their malignant hatred, nor shaken their determination to take his life. They urged that he should be tried by the Sanhedrim, and requested that he be immediately sent to Jerusalem. Although this request was so plausible, it concealed a deep-laid plot. They were resolved not to leave him even to the decision of the Sanhedrim council, but to summarily dispose of the case by murdering him on the way. At Caesarea, Festus had already met the popular clamor against Paul, but at Jerusalem the demand for his death was not merely the cry of the mob. 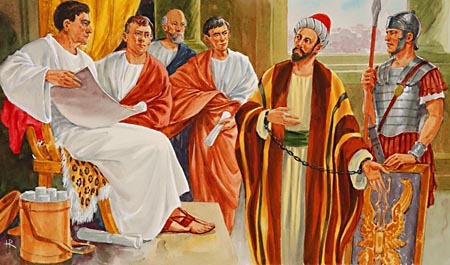 A deputation of the most honorable personages of the city, headed by the high priest, formally presented the request concerning Paul, not doubting that this new and inexperienced official could be molded at pleasure, and that to gain their favor he would readily grant all that they desired. But Festus was not a man who would sacrifice justice to gain popularity. The Jews soon found that they were dealing with one who more resembled a Gallio than a Felix. With keen insight he penetrated the motive that prompted their request, and courteously declined to send for Paul. He stated, however, that he himself would soon return to Caesarea, and that he would there give them a fair opportunity to prefer their charges against him. This was not what they wanted. Their former [p. 248] defeat was not forgotten. They well knew that in contrast with the calm bearing and forcible arguments of the apostle, their own malignant spirit and baseless accusations would appear in the worst possible light. Again they urged that Paul be brought to Jerusalem for trial. But Festus answered decidedly that whatever their practice might be, it was not the custom of the Romans to sacrifice any man's life merely to gratify his accusers, but to bring the accused face to face with his accusers before impartial witnesses, and to give him an opportunity to defend himself. God in his providence controlled the decision of Festus, that the life of the apostle might be preserved. Finding their purposes defeated, the Jewish leaders at once organized a powerful deputation to present their accusations at the court of the procurator. After a stay of eight or ten days in Jerusalem, Festus returned to Caesarea, and the next day took his seat at the tribunal to hear the case. The Jews, on this occasion being without a lawyer, preferred their charges themselves. The trial was a scene of passionate, unreasoning clamor on the part of the accusers, while Paul with perfect calmness and candor clearly showed the falsity of their statements. The Jews repeated their charges of heresy, treason, and sacrilege, but could bring no witnesses to sustain them. They endeavored to intimidate Festus as they had once intimidated Pilate by their pretended zeal for the honor of Caesar. But Festus had too thorough an understanding of the Roman law to be deceived by their clamor. He saw that the real question in dispute related wholly to Jewish doctrines, [p. 249] and that, rightly understood, there was nothing in the charges against Paul, could they be proved, that would render him worthy of death, or even imprisonment. Yet he saw clearly the storm of rage that would be created if Paul were not to be condemned or delivered into their hands. He looked with disgust upon the scene before him,—the Jewish priests and rulers, with scowling faces and gleaming eyes, forgetting the dignity of their office, eagerly reiterating their accusations, in tones that grew louder and louder until the tribunal rang with their cries of rage. Heartily desiring to end it all, he turned to Paul, who stood calm and self-possessed before his adversaries, and asked if he was willing to go to Jerusalem under his protection, to be tried by the Sanhedrim. This would virtually transfer the matter from Roman to Jewish jurisdiction. Paul knew that he could not look for justice from that people who were by their crimes bringing down upon themselves the wrath of God. Like the prophet Elijah, he would be safer among the heathen than with those who had rejected the light from Heaven, and hardened their hearts against the truth. When his life had been imperiled by the wrath of his enemies, it was heathen magistrates that had been his deliverers. Gallio, Lysias, and even Felix, had not hesitated to proclaim his innocence, while every Jewish tribunal had condemned him, without proving his guilt. Paul was weary of strife, weary of the fierce reiteration of charges, again and again refuted, and as often renewed. His active spirit could ill endure the repeated delays and wearing suspense of his trial and imprisonment. How repulsive to him had been the daily contact with [p. 250] the coarse, idle, unprincipled soldiery, the frequent sounds of contention, and the rumors of strife and bloodshed between Jew and Gentile. He had nothing more to hope for from Jewish priests or rulers; but as a Roman citizen he had one special privilege, he could appeal to Caesar, and for a time, at least, his enemies would be kept at bay. To the governor's question, Paul made answer, I stand at Caesar's tribunal. Here, and not before the Sanhedrim, I ought to be judged. Turning to the procurator, he appealed to him directly: Even you, Festus, are convinced that no charges have been sustained against me. I have never in any respect wronged the Jews. If I have committed any crime, it is not against them, but against the emperor; and if found guilty, I do not refuse to die. But if the accusations they bring against me cannot be proved, no one can give me into their power as a favor. I appeal unto Caesar. Festus knew nothing of the conspiracies of the Jews to murder Paul, and he was surprised at this appeal to Caesar. It was not flattering to the pride of the Roman procurator, that the first case brought before him should be thus referred to higher authority. However, the words of the apostle put a stop to the proceedings of the court. Felix held a brief consultation with his counsel, and all agreeing that the appeal was legally admissible, he said to the prisoner: "Hast thou appealed unto Caesar? unto Caesar shalt thou go." This was said in a tone and manner which seemed to imply that Paul little knew what an appeal to Caesar meant. Once more the hatred born of Jewish bigotry and self-righteousness had driven the servant of [p. 251] God to turn for protection to a heathen ruler. It was the same hatred that forced the prophet Elijah to flee for succor to the widow of Sarepta; that constrained the heralds of the gospel to proclaim their message to the Gentiles. It is the same spirit that the people of God in this age have yet to meet. In the great crisis through which they are soon to pass, they will become better acquainted with the experience of Paul. Among the professed followers of Christ, there is the same pride, formalism, vainglory, selfishness, and oppression, that existed in the Jewish nation. Before the warfare shall be ended and the victory won, we as a people are to experience trials similar to those of Paul. We shall encounter the same hardness of heart, the same cruel determination, the same unyielding hatred. God would have his people prepared for the soon-coming crisis. Prepared or unprepared, we must all meet it. Only those whose characters are thoroughly disciplined to meet the divine standard will be able to stand firm in that testing time. But when enemies shall be on every side, watching them for evil, the God of Heaven will be watching his precious jewels for good. When secular rulers unite with the ministers of religion to come between God and our conscience, then those who cherish the fear of God will be revealed. When the darkness is deepest, then the light of a noble, Godlike character will shine the brightest. When every other trust fails, then it will be seen who have an abiding trust in God. The stronger and purer the faith of God's people, and the firmer their determination to obey him, the more will Satan stir up the rage of those who claim to be righteous, while they trample upon the law of God. In that coming emergency, rulers and magistrates will not interpose in behalf of God's people. There will be a corrupt harmony with all who have not been obedient to the law of God. In that day, all time-servers, all who have not the genuine work of grace in the heart, will be found wanting. It will require the firmest trust, the most heroic purpose, to hold fast the faith once delivered to the saints. Click here to read the next chapter: "Address Before Agrippa"